Most businesses today rely on email to exchange information, but it can be all too easy for messages to get lost in your inbox – and when that happens, you risk missing out on vital details that could impact your communication with your customers. Wouldn’t it be great if you could file those messages with their associated records in your ERP solution, without having to manually copy and paste the text? This means that any user with access to these records can view the email right from within aACE. 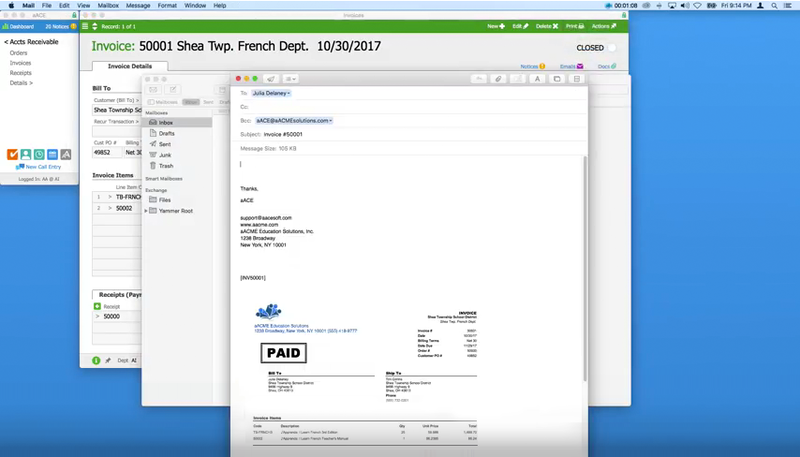 So when Julia contacts her account manager at aACME, Mara Harvey, with a question about the invoice, Mara is able to immediately see what was sent to Julia and when – there's no need to ask John to forward the email or to dig through a long email chain to find the relevant information. With aACE’s email integration feature, Mara and her colleagues have everything they need right at their fingertips. To see how other aACE features could work for your business, check out our aACE Videos series. And if you’d like to know more about this feature or discuss what else aACE can do for you, contact us today to learn more.